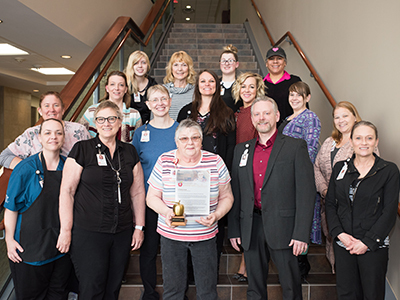 Jamestown Regional Medical Center recently announced Elayne Hartman as its most recent Legend Award recipient. The Legend Award is the most prestigious distinction for a JRMC employee. The Legend Award recognizes employees who certainly exceed expectations and make THE difference in the lives of those they serve. JRMC Foundation Office Coordinator, Penny Holland, and Nutrition Services Aide, Jewel Wolhart, nominated Hartman because of her compassionate heart for helping fellow coworkers, patients and guests. Hartman joined the JRMC team in 2011 and resides in Jamestown. JRMC’s 350 employees cast anonymous votes to select the Legend Award winner. The purpose of the Legend Award is to inspire, motivate and capture the moments that define JRMC. The goal is to help employees and volunteers connect to the sense of purpose that brought them to the organization. This award is for employees who’ve made extreme efforts to benefit their patients and colleagues. “The nominations inspire staff members to continually be the best, exceed expectations and make THE difference in the lives of those we serve,” said JRMC President & CEO, Mike Delfs. Once nominated, both JRMC administration and employees voted on their top nominees and their stories. The Legend Award first began in 2012. Since then, more than 30 individuals have been named Legends and more than 110 employees have been nominated. Elayne Hartman, Nutrition Services, truly makes a difference for her JRMC family. Elayne has such a big heart for helping people. She has helped Jewel Wolhart, Nutrition Services, many times during the past year when Jewel’s family experienced several medical emergencies. Elayne offered encouraging words and great advice to help Jewel through situations she has experienced herself. When Jewel’s husband was undergoing medical treatments, Elaine provided guidance to help Jewel save substantially on prescription costs and helped her obtain gas cards for expensive out-of-town medical appointments. Elayne then reached out to Penny Holland, Foundation, to help Jewel’s granddaughter who was struck by a vehicle last fall and suffered extensive injuries. Because of her injuries, her time spent in school is limited. Elayne wanted to find a way to get a laptop donated so Jewel’s granddaughter could communicate with her teacher and stay current on homework. Because of Elayne’s initiative, United Way donated a laptop to Jewel’s granddaughter. And, an additional grant was awarded from the Employee Support Fund at JRMC to purchase the software necessary to communicate with the school. Elayne Hartman, you are THE difference at Jamestown Regional Medical Center.